1. . . that summer was not as hot as the previous sixteen. I'm starting to enjoy summers again. 2. . . I can look forward to crisp autumn mornings and the coziness that comes with fall. 3. . . for my parents, who celebrate their 55th wedding anniversary this week. 4. . . for my oldest grandson, who turns 3 on the same day as my parents' anniversary. 5. . . for continued healing. I've discarded the crutches. 6. . . for grasses. I've decided I really enjoy the impact they make in the landscape. 7. . . for the fall harvest. 8. . . for neighbors who share their bounty, whether that be carrot cake, cookies, or zucchini. 9. . . for the chance I have to attend a social media convention today and tomorrow. I'm looking forward to learning how to improve the blog and better utilize other channels. 10. . . for John. We spent last Saturday surveying our backyard (I now know how to use a transit! ), and last night we attended the BYU women's volleyball game. Whether we are working or playing, we enjoy spending time together, and I'm thankful for the good relationship we share. What are you thankful for this week? Feel free to comment below and/or link up your own post. Also, be sure to read posts from other bloggers who have linked up! Health, family and friends, all a wonderful basis for thankfulness. Thank you for hosting! Good to hear that you have thrown away the crutches (not literally, I assume, but I just had a flash of Tiny Tim). Years ago I have to use them for a month or so, it provided me with one of the most powerful, yet, all things considered, relatively mild shifts in perspective. To appreciate how ease of access can so be taken for granted. I was hoping for a few more months of plus 90 degree days. Given that I haven't moved from southern New England, I'm beginning to think maybe its not going to happen this year. (We have a couple of outgrowths of some type of wild grass, always mow around them. Definitely adds interest to the lawn. If New England keeps 90+ temps for the next three months, that would be something! 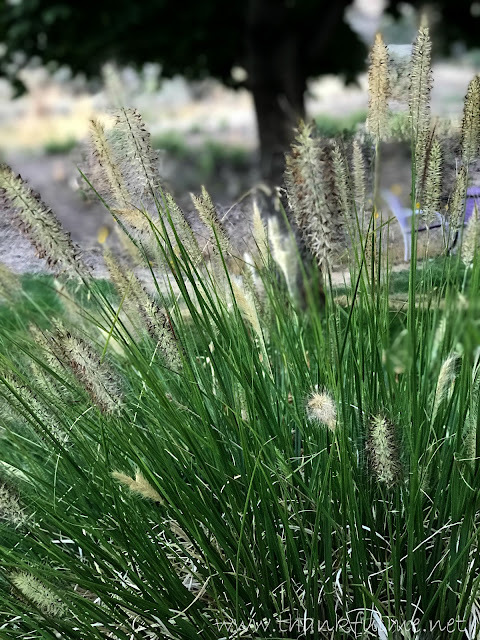 My favorite grass is the purple fountain grass. It is very striking. The social media convention sounds interesting. 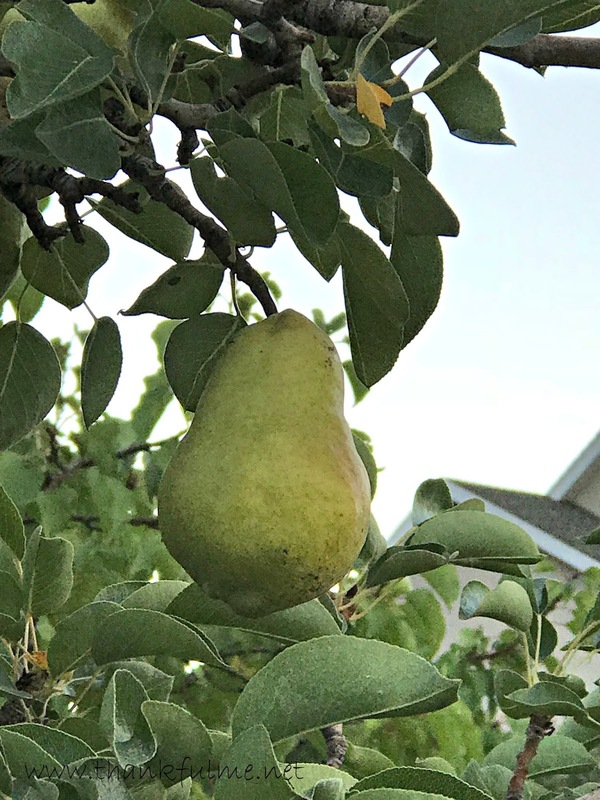 That is a huge pear on your tree. Are there more? Yeah for your continued healing! The convention was interesting; now I need to go back through my notes and decide what tips and ideas I want to try. The pear isn't actually huge, but there are more where that came from. I hope you and John like pears! That one looks great so I'm sure you've got a healthy crop already or on the way! If by dance, you mean that little limp-hop move I do every I get up from a sitting position, then yes! :-) After a step or to, I'm back to normal. We do enjoy pears, which is fortunate. It's good to hear you can discard the crutches. And an anniversary and a birthday are so good things to be thankful as well! I love your photography. And as a person who grew up on the prairie I agree wholeheartedly about the beauty of grasses. Thank you. The image of grass-covered prairies always reminds me of America the Beautiful.